Cedefop's Head of Department for Learning and Employability Antonio Ranieri opened the event. 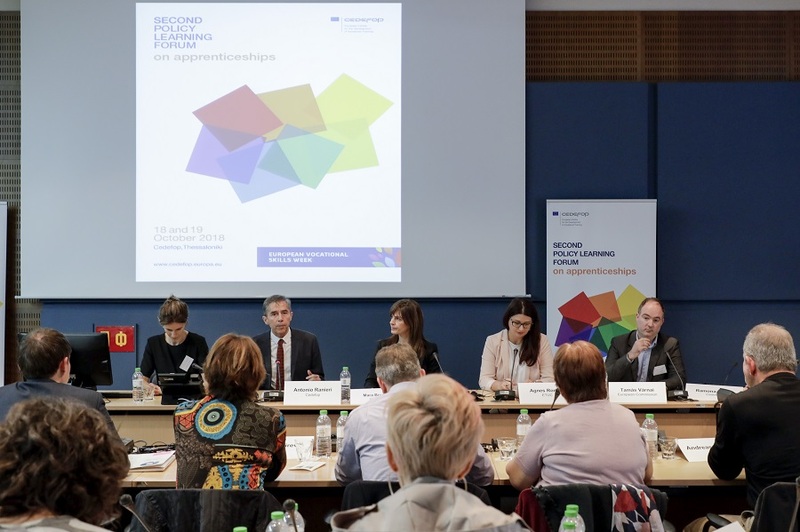 Nine European countries that have taken part in Cedefop's thematic country reviews (TCRs) presented successes and challenges, and four countries that did not take part were invited to share their apprenticeship experiences. Since 2014, Cedefop has carried out TCRs on apprenticeships in volunteer countries: Lithuania and Malta (2014-15); Greece, Italy and Slovenia (2015-17); Cyprus and Croatia (2017-18). A lighter version, flash TCRs, has been piloted in Belgium (French-speaking Community) and Sweden. Review outcomes were discussed in the forum's morning session. In the afternoon parallel workshops, the four invited countries that have not undertaken the TCR exercise - Austria, England, Ireland and the Netherlands - presented their systems in depth. On the second day, participants worked in groups to come up with ideas on the future of the PLFs and on an extended community of practice, experts reported on the workshops and a feedback session showed satisfaction with the opportunity to learn from other countries' experiences. In the final session, ETUC's Agnes Roman explained why apprenticeship is important to the European trade unions and underlined their effort to make sure it is not considered cheap labour. The European Commission's Tamás Várnai talked about the Commission initiatives to support apprenticeships, including the European alliance for apprenticeships which celebrates its fifth anniversary this year. As Ms Brugia pointed out, challenges to build quality apprenticeships are not common to all countries. Solutions need to fit country contexts. Bringing all stakeholders around the same table is crucial. The event was linked to the European vocational skills week 2018 of which Cedefop is a partner. The next PLF will take place in early 2020.